SALISBURY, England (AP) — The health implications of the nerve agent attack on a Russian ex-spy and his adult daughter broadened Sunday after British officials said limited traces of contamination were found in a restaurant and a pub in the English city of Salisbury. Public health officials said the risk of others being sickened by the chemicals that put the father and daughter in critical condition a week ago was very low. But they advised people who had patronized the businesses during a two-day period to wash their clothes, double-bag articles for dry cleaning, and wipe down items like jewelry. "It's really important to understand the general public should not be concerned. There is, on the evidence currently, a very low risk." Dr. Jenny Harries of Public Health England said at a news conference. Sergei Skripal, 66, and his daughter, Yulia, 33, were found comatose on a bench near the Zizzi restaurant and The Mill pub on March 4. Several hundred people would have been in the Salisbury establishments that day and the day after, Harries said. The public health concerns — and the seven days it took authorities to give instructions for reducing possible exposure risks — increased pressure on the British government to take action against whoever is deemed responsible for the rare nerve agent attack. Treasury chief Philip Hammond added his voice Sunday to the chorus of senior British figures vowing that strong steps will be taken if a foreign government is found to be responsible. Britain would "respond appropriately" in that case, Hammond said. Authorities have not yet named the nerve agent used or signaled that the evidence collected so far suggests another government is to blame. The widow of another Russian former spy who was poisoned in England and spent three weeks hospitalized before he died told the BBC on Sunday that British officials have not made good on a written promise to take every possible step to prevent crimes like the killing of her husband, Alexander Litvinenko. "It means something was not done," Marina Litvinenko said of the attack on Skripal. "And the lesson that we received after the murder of my husband was not learned." She said Prime Minister Theresa May signed the agreement in her earlier capacity overseeing domestic security as Britain's home secretary. In Moscow, a former neighbor of Skripal said that if the Russian government had wanted the ex-spy dead, he would have already been killed in Russia. Nikolai Tsiplakov told The Associated Press in an interview that he lived in the same building as Skripal's family before Skripal, a retired military intelligence officer, was imprisoned for spying for Britain. "You need to understand, he's a former spy and he's a traitor. If they wanted him dead, they would have killed him in Russia a long time ago," Tsiplakov said. In Salisbury, a medieval city near the ancient monument of Stonehenge where Skripal lived, health officials tried to reassure the public. 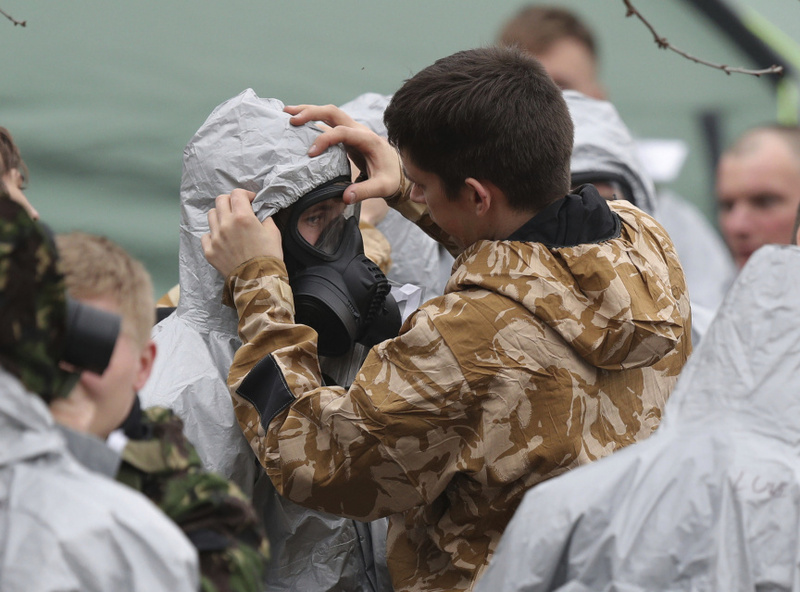 They described the safety advice as precautions to prevent any ill effects that might come from repeated contact with minute amounts of the nerve agent. Harries said there was no evidence restaurant and bar patrons had gotten traces of poison on their clothes, but that it was "practical" to take proactive steps. Even so, Harries said clothing with traces of contamination would not cause harm after a few days; problems might develop if there was "repetitive" exposure over weeks and months, she said. Authorities haven't revealed how or where the Skripals were exposed to the nerve agent. They remain in critical but stable condition. A British police detective who came to their aid is also hospitalized in serious condition. He is said to be conscious and talking to visitors. Hospital officials in Salisbury stressed there was no evidence of a wider risk beyond those three people, although at least 21 have sought treatment or medical advice since the attack. The reassurances did not completely calm the concerns in Salisbury. "I think they could probably have informed people a little bit sooner," said resident Julia Hayes, whose daughter was in the pub about the time the critically ill Skripals were discovered. "She was a little bit disappointed because she's only just been told that she should actually wash all her clothes and, you know, her handbags. She said a week later is a bit late maybe," Hayes said. Some visitors remained cautious. Jane Gould said she was trying not to touch anything during a daytrip to Salisbury. The government's health warning said that any clothing worn in the pub or restaurant on March 4 or March 5 should be washed in "an ordinary washing machine using your regular detergent at the temperature recommended for the clothing." It also said to "wipe personal items such as phones, handbags and other electronic items with cleansing or baby wipes and dispose of the wipes in the bin." It urged people to make sure to wash their hands afterward. Investigators hope they can pinpoint where the nerve agent was made, which could help determine who was behind the attack. Forensics experts wearing full body protective gear continue seeking evidence in Salisbury, where the sites include the Zizzi restaurant and the gravesites where Skripal's wife and son are buried. Skripal's house has also been extensively searched for clues and traces of the nerve agent. Officials say more than 250 counterterrorism officers are on the scene evaluating more than 240 pieces of evidence and interviewing about 200 witnesses. Skripal, a former Russian military intelligence officer, was convicted of spying for Britain and imprisoned in Russia before he was freed in a 2010 spy swap. He had stayed out of the public eye since settling in England. Some British lawmakers have asked for an investigation of other serious mishaps involving former Russia spies and foes of Russian President Vladimir Putin who have taken up residence in Britain.